Ron Steen with the 900+ privacy kits to go on every safety shower on site at QAL. The Gladstone Men’s Shed at Barney Point has got a lot going for it. It’s brand-new and generously appointed with great gear, a lot of it acquired through generous sponsorships from the GPC, QGC and Uniting Care community and a host of other businesses, but probably its most valuable asset lies between the ears of its hundred plus members. The Shed opens two mornings a week and, in the beginning, around 25 would show up and work on their own projects. Now they regularly attract over 40 people to the workshop and the demand for collaborative projects grew: “We had a few come in and build rocking horses but the majority would ask for some work to do,” Secretary Ron Steen explains. 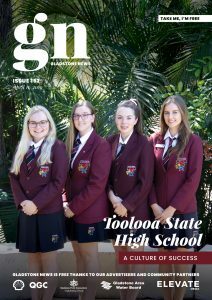 Without being ageist, there is probably several hundred years of industry experience represented at the Gladstone Men’s Shed – among them retired draughtsmen, engineers, technicians and tradesmen – and they’re put it to good use, for fun and to fund the Shed’s budget. Each lid is hand-lathed to ensure an adequate seal that is easily removed in a hurry, in the event of a caustic spill. 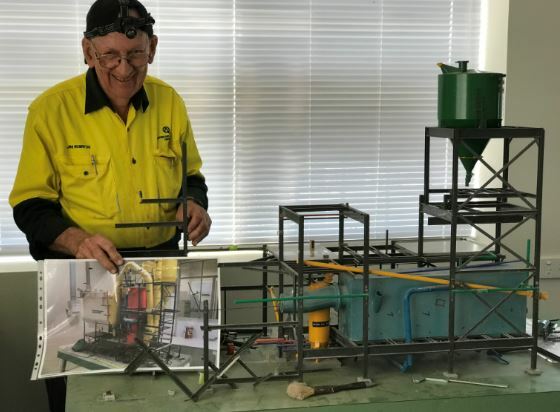 It’s a unique product– while the kit was always there, it was stored in plastic bags, which would perish after periods of disuse – and the Men’s Shed low-cost solution fills an industry niche and keeps everyone busy. “We only undertake projects that nobody is doing already, we would never undercut a local business,” Ron says. Another unique project was the invention and supply of small PVC sheaths to stop the lids snapping off DAP-spray bottles in pocket-holsters – DAP is a neutralising agent for caustic, carried all day by many alumina workers for emergencies. But perhaps the most specialised project the Shed is undertaking – and it’s debatable if there’s anyone in town better up to the task – is the restoration of a model LURGI, or Alumina Fluid Bed Calciner which was smashed in an office move at QAL. “If they break it again, I’m not speaking to them anymore,” he said. Jim McBryde with the model LURGI he is restoring.